To build a good minifig scale Grievous with the right articulation and proportions is a real challange. 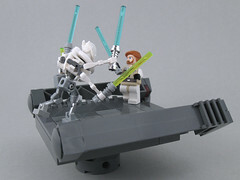 This one is made to match the Clone Wars minifigs so I thought a somewhat cartoony style was the way to go. Right now the photos on my Flickr account is just this one pos�, but I'm going to upload pics of the two armed General as well. Take a look at the pics and tell me what you think. Excellent, except for the colors of the legs, obviously. But unless you paint it, there's really nothing you can do about that. So good, I'd buy one. There's nothing wrong with the legs. Larry, once again you build a stunner. This is awesome. The arms look kinda small, and the connections on the legs look questionable, but overall it's pretty accurate. Full of win indeed. The chest portion looks great. My only gripe is the mixture of lightsaber handles, but that's just personal preference. Question: Why did I just wet myself? Answer: Because that is frakkin' beautiful. Yes, that General Grievous is quite nice. I really wouldn't care if the arms were blue and the torso and legs were green. That is a nice build, man. And nice choice on using light bley rather than dark bley on the legs. The less contrast the better. Anywho, nice work. Question 2: What is that piece around his neck? Is that a sink or toilet piece? By legs, are we referring to the arm pieces used for the robots in Exo-Force? You are all aware that these come in white, aren't you? Really good MOC of GG. I just finshed watching the "Grevious Liar" episode and then looking at the TLC version of GG was pretty disappointed. You have done a great job indeed. Also really liked the little platform you built, and your photos are really well done, you certainly display your creations very well. 1) Are the arms posable? 2) Could you give us instructions? than any other moc of him iv ever seen. Thanks for the comments and compliments. Much appreciated. I kind of expected to see that toilet seat comment actually. Being the animated Grievous from the Clone Wars I think his big chestplate and collar bone adds to the cartoony look of this version of the fig. I've uploaded some new pics to show why the big toilet seat collar had to be there. 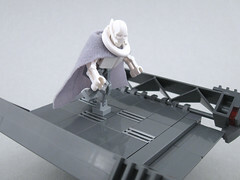 Check out the pics and let me know what you think about this Grievous in his cape. The Cape is custom made from the cape that came with one of the big castle knights. I have already commented on Grievous, but I never commented on the platform. That is a Great looking platform. I've uploaded this instruction pic. 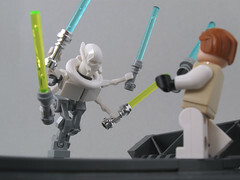 Check out the pic on Flickr for some notes on how to bend the legs for the best Grievous posture effect. Thanks again for all the nice comments. Toilet jokes and all.